The tyre killer teeth retract below ground depending on the type of barriers type and providing safe access forauthorized vehicles. When the vehicle passes, the teeth returns to the active position ensuring totalprotection from unauthorized vehicle. 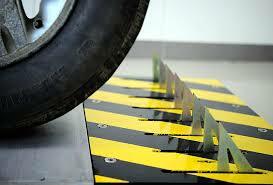 We have three different types of Tyre Killer barriers available to suit you requirement. 1. Self-working, One Side Traffic Tyre Killer for Exit / One-way protection. 2. Manually operated Tyre Killer for high security installation. 3. 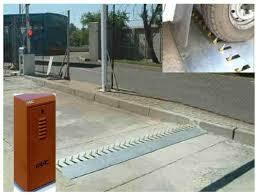 Electro/Hydraulic operated Tyre Killer for high security installation. etc. Elector/Hydraulic Tyre Killer Barrier comes with push-buttoncontrol as standard, however it can be customized tointerface with a wide range of access controlequipment to suit specific customer requirements and can be configured to use with Inductive loop systems, cardreaders, biometric access control and mannedguard post. Also panic systems can be accommodated. We strongly recommend thefitting of a recordable CCTV system, traffic lights, safety systems and backup power system. Self-working, One Side Traffic Tyre Killer. Top Plate Mounted Components. Designed for Heavy Load Traffic. Maintenance Free/Easier Cleaning. Maintenance Free/Easier Cleaning. Durable weight active System. Heavy Duty Steel Construction. Trouble Free Operation. Override / Keep Open option. Heavy Duty Steel Construction. Specially Engineered ½” thick nails / spikes. Override / Keep Open option. Tyre Killer Spikes rises up to 6” (150mm) above ground. Specially Engineered Independent working 6mmthick Teeth. Easy to Install due to box type design. Tyre Killer Spikes raises 3” to 4” (75~100mm) above ground. Maximum Length up to 4 meter per unit. Easy to Install due to box type design. Manually Operation with removable arm. 1 meter units easy to attach with each other offers scalability. Electro/Hydraulic Operation in hydraulic operated type model. 1. Type of Tyre Killer required.